For this week’s installment of Dubspot Radio Podcast, we are pleased to have prolific music producer and downtown New York native, Blockhead. For the latest Dubspot Radio Podcast, we sat down with prolific hip hop music producer and downtown New York native Blockhead a.k.a. Tony Simon for an exclusive interview and overview of his discography. Tony started as a rapper but found his calling as a beat-maker. He has collaborated extensively and produced beats for critically acclaimed rapper Aesop Rock, and also worked with underground hip hop luminaries like Atmosphere, Murs, and Mike Ladd. As a solo artist, he has released critically acclaimed instrumental albums, including his now classic debut “Music by Cavelight” and the sophomore effort “Downtown Science” on the influential independent imprint Ninja Tune. Many of the tracks in this podcast are mainly solo instrumental works mixed with some newer featuring less familiar rappers. Together they offer a brief look into Blockhead’s work for the past two decades as a solid music producer. Tony Simon, a.k.a. Blockhead has been making and releasing utterly distinctive, funky, and emotive music for the last two decades. Blockhead grew up in downtown New York City. As the son of an artist, surrounded by visual culture, he found that his passion was for music. A fan of a whole range of sounds, especially hip hop, Blockhead steadily built a tremendous collection of tapes and later CDs from innumerable artists, as well as an accumulation of knowledge and know-how. After a brief stint as a rapper, he realized his calling was behind the boards and not on the mic – and from there he began to produce beats. Since making that decision, he’s kept pretty busy carving a niche as a sought-after underground beat maker that people call when they want something special. Blockhead produced nine tracks on Aesop Rock’s critically acclaimed album “Labor Days.” Additionally he produced half the tracks on Aesop’s follow up EP, “Daylight.” He has also worked with other indie giants Atmosphere, Murs, Mike Ladd, and Illogic. In between, he found time to complete a breakbeat album entitled “Blockhead’s Broke Beats,” with ten hard-hitting instrumental tracks, which released on Mush Records, the US home of cLOUDDEAD. To understand Blockhead’s Stateside presence and gravitas – look no further than the fact that he has also contributed three tracks (including the first single) for Cage’s “Hell’s Winter” on Def Jux. The other producers on the project are DJ Shadow, El-P, and RJD2. All this occurred simultaneously to his debut album on Ninja Tune, “Music By Cavelight.” The album is described as “one of the most fantastically good albums you’re going to hear this year” (Sunday Telegraph) and “a beautiful record” (Metro). Blockhead himself was tipped as “definitely one to watch” (Touch). 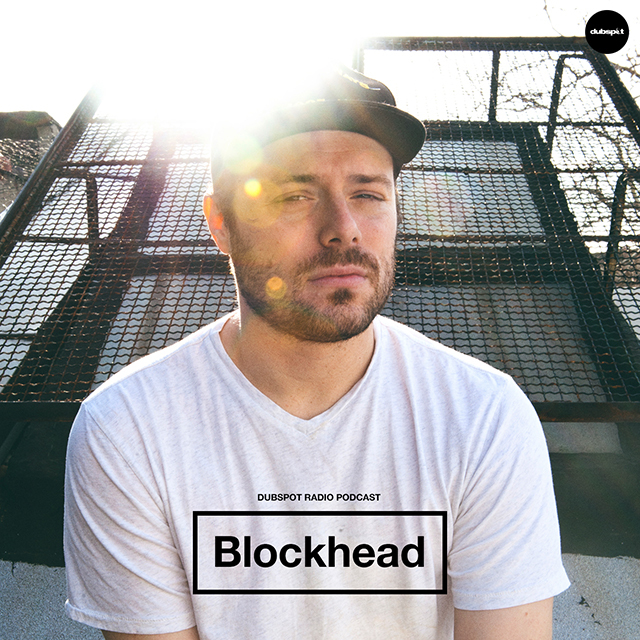 Blockhead returned in 2005 with “Downtime Science,” another set of deep, emotional instrumental hip hop tracks dedicated to the downtown area of Manhattan where he grew up and has lived his entire life. The album encompasses all the attitude, anger, and edginess of the neighborhood and features some melancholy reflections upon failed relationships and the promise of future loves. In 2009 “The Music Scene,” was released, and with it both critical acclaim and commercial success – launching Blockhead on a global string of headlining dates ranging from Pittsburgh to Poland. He participated in the world famous Zubroffka festival, providing a live score for some of Charlie Chaplin’s earliest films. Blockhead followed this album with “Interludes After Midnight,” further showcasing his development as a solo artist with a unique voice. Keep up with Blockhead on Soundcloud, Facebook, Twitter, and on his blog Phat Friend. 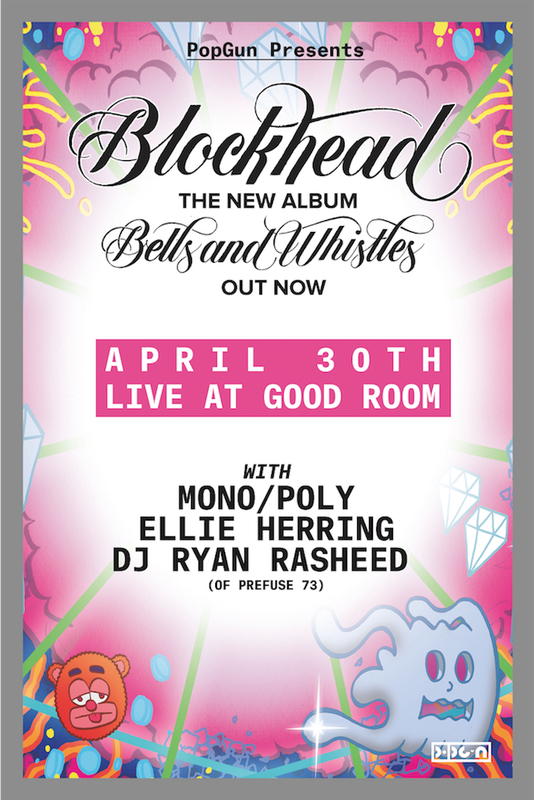 SHOW ALERT >> PopGun Presents… Blockhead alongside Mono/Poly, Ellie Herring, and DJ Ryan Rasheed (of Prefuse 73) at The Good Room in Brooklyn on Thursday, April 30th, 2015. Don’t miss it!